After reviewing the most recent outdoor wedding tents online, we've determined that the Quictent brand is the best wedding canopy on the market. It provides high quality, great size for a good price that will fit in most weddings. We highly recommend checking it out. Outdoor wedding tents can provide shade during extra sunny moments, and offer shelter from the rain when the weather is less than ideal. They offer an ideal setting for any outdoor wedding that is being held, no matter how the weather turns out for the day. Just a few of these tents at your event will help ensure you and your guests are covered. 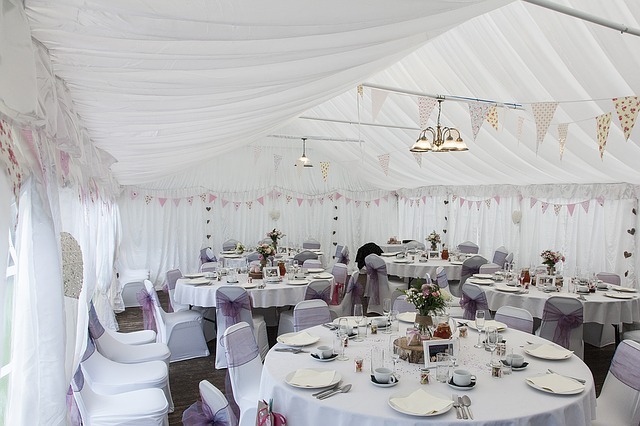 Many wedding tents are quick to set up and are easy to manage. They are built to withstand various temperatures, and can be put out the morning of the wedding. Some are a little more tricky, requiring advanced setup time at least the night before. Utilize either of these tents in order to ensure all your basis are covered on your special day. The heavy duty gazebo pavilion comes in white. It has multiple window sections to allow plenty of light to make its way inside and keep the space bright. A durable, waterproof cover made of polyethylene ensures no rain can make its way in, so everyone and everything inside is guaranteed to stay dry. The steel framework is coated with a powder that is resistant to corrosion and rust. This ensures it will remain sturdy and usable for future events as well. This large wedding tent is 10 feet by 30 feet. This canopy wedding tent has seven sidewalls. The 10x30 dimensions ensure plenty of space is available for a variety of guests, with three separate sections included. A large area in the middle is left open so guests can come and go as needed. The ultra white color is ideal for weddings, and the included windows bring in light to keep the space lit up and ready for use. The framework is rust and corrosion-resistant, allowing you to use this tent for years to come, no matter the occasion. If you want to enjoy some shade while still allowing the sun to shine around you and your guests, the Quictent gazebo canopy is the one for you. There are six removable walls that can either be left up or taken down completely. You can take down all walls to just have a cover, or take down three of them to leave an entire side open. It helps keep the air flowing. Roughly 30 people can be held under just one tent. This wedding canopy tent has eight sidewalls, each of which are removable. Six of them include windows that allow in light, while two of them are zippered to offer doors. Not only is this tent waterproof, but it is also protected from harmful UV rays. You and your guests can enjoy your time outdoors with this tent. All necessary materials are included to ensure quick setup. It can be placed on hard surfaces like driveways, or soft surfaces, such as a lawn. The top of this canopy tent provides 99% UV protection. The framework is coated with a powder that resists corrosion, keeping the tent sturdy and rust-free. The included cover is waterproof. There are five sidewalls included, each containing windows to allow plenty of light to shine through and offering a look at other activities going on in the vicinity. You, your spouse, and 28 guests will be sheltered under this large gazebo pavilion. Outdoor wedding tents greatly enhance the overall look and feel of an outdoor reception. Rather than having to stand out in the open in direct sunlight, or be exposed to wind and rain, guests can all enjoy some time under the tent to stay dry and cool. Most brands offer the full assortment of tools and accessories needed to set up the tent in time for the big day.